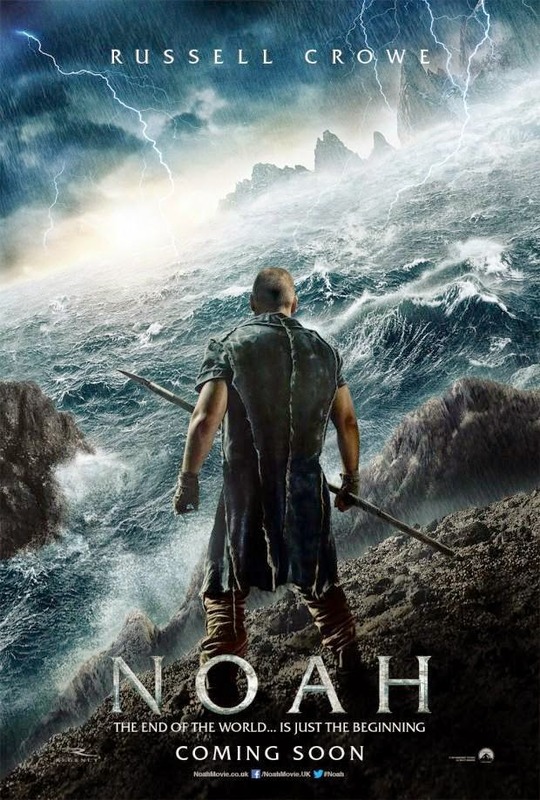 After witnessing the murder of his father as a young boy, Noah (Russel Crowe) soon grows up and starts his own family, with wife Naameh (Jennifer Connelly); sons Shem (Douglas Booth), Ham (Logan Lerman) and Japeth; and Lla (Emma Watson), a girl who is injured in a brief battle and joins them on their adventure, soon becoming Shem's wife. Over the course of eight years after numerous signs and warnings, Noah, his family and a group of fallen angels known as Watchers build an ark in order for his family and the animals seek refuge from an enormous flood. However, after a trip to a nearby town, led by the savage Tubal-cain (Ray Winstone), Noah soon becomes possessed by the idea that the Creator wishes for all of humanity to end, leading to problems not only with the ark, but within his family. Noah is, potentially, one of the strangest films I have ever seen. Based upon the trailers and pre-release interviews with Crowe himself on various websites, I was under the impression that this film would be the story of Noah, as well all know it, but told without the concept of religion. The actual result, however, could not be further from the case. The use of religion and various elements of religious iconography are so prominent and so heavy in this film, for people of an atheist approach, this could well cause a strong reaction, as no atheist particularly wants to spend 140 minutes being taught the Bible. From an agnostic approach, however, it isn't too bad. Noah is heavy, and its a far cry from anything Darren Aronofsky has made prior to this, but it also makes for quite powerful viewing. This could well be the most polarizing film of the year. Crowe is, as usual, terrific. When Noah needs to be calm and collected, Crowe manages this well, but as the stakes are raised towards the film's final moments (which are bone-shatteringly tense) he truly excels. He's always been more of a shouter than a speaker, but it doesn't really matter here. He plays this tremendously. If there was ever a well known figure that Crowe was born to play, it was Noah. Lerman is also strong here. I was impressed with his work in 2012's The Perks of Being a Wallflower, but this could well be his big break. As the more neglected of the older two sons, he's given a chance to showcase his talent for emotional acting, and he really manages to draw the viewer in; we connect with him emotionally more than any other character. Whilst the majority of the supporting cast are passable, unfortunately Watson isn't. I loved her acting in the Harry Potter series, and she too was great in Wallflower, but her performance in Noah borders on excruciating. One of the animals from the ark could have added more emotional depth and character than she does here. Visually, Noah is something extraordinary. Whilst the large panning shots and countless close ups of the CGI animals aren't quite as strong as the similar shots from Life of Pi, the effects of the rain and the ark itself are quite something. However, the costume and make-up departments also truly excel. Even if Noah can't quite manage itself on a dramatic level, it's almost always interesting to look at. The Watchers are designed well, and are always a welcome feature in their scenes. Despite being made of rock, they too give a more emotional performance than Watson. Aronofsky's camerawork is also effective; ranging from intense close ups on the faces of our characters to large sweeping shots. Almost everything technical is near faultless, really. It's just a shame that Noah falls apart so much with its story. It's a story that everyone knows already, albeit with a few minor tweaks here and there. But when Aronofsky's story retains so many parallels with the original story of Noah's Ark, we know where the film is going before it gets there. Almost every twist and turn is predictable, and it soon becomes boring. It also takes far too long to get going; I'm all for a bit of character development and story set up in the opening moments, but here it's about forty minutes until anything of interest actually happens. There's also the heavy dosage of religion. Sure, bring that side of it into the story, but repeated cut-aways to the Garden of Eden is too much; it just isn't needed. It almost feels as if Aronofsky is attempting to appeal to theists, atheists and agnostics all at once, and with a story about Noah's ark, loaded with CGI animals and Emma Watson, that simply isn't possible. Noah, for me, isn't a bad film. It's just one that wasn't made the way it should have been. To Summarise: Despite an unnecessary reliance on religion and multiple narrative issues, Noah remains a generally well acted, visually impressive treat with just enough scope to support its scale.